Haremos una pausa de el tema de las formas para observar con amor la belleza de la naturaleza. 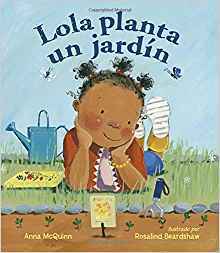 Leeremos “Lola planta un jardin” por Anna McQuinn. ¿Que plantaras tu en tu jardin? ¿Como ayudaras a nuestro planeta? We will pause from the shapes theme to observe the beauty that is nature. We will read “Lola plants a garden” by Anna McQuinn. What will you plant? How will you help planet Earth?